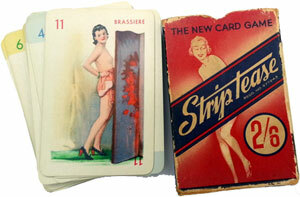 Strip Tease is an amusing card game for adults featuring characters involved in the performance and subsequent prosecution of an imaginary strip tease show, published and registered by Raphael Industries Ltd of 33 Lower Regent St, London, in 1937. The deck contains four suits: Striptease, Theatre, Court and Prudie. The game can be played in one of two variations depending upon the number of players. The following is a simplified synopsis of the general rules. In the standard game, played by four players in two teams of pairs who sit opposite each other as in Bridge or Whist, one team "prosecutes" and the other "defends", with both teams trying to take tricks in order to win the "case" and either convict or reveal the stripper! In the second variation, playable by three or more players, the game is again played like whist with some unique twists, but the object is to avoid winning tricks which contain "Strip Tease", the Theatre Manager or Producer cards, on penalty of being awarded penalty points known as months imprisonment. At the end of the game the player with the least penalty points (shortest prison sentence) wins. Above: click the box to zoom. Some of the characters are: Spoil-Sport, Miss Prim, Sour-Puss, Informer, Wowser, Snark as well as Police Officers, Lawyers and a Judge. The strip tease scenes are slightly risqué! Strip Tease was registered at Stationers Hall in 1937 to Raphael Industries. They probably had it printed by De la Rue. An unopened Strip Tease box is sealed in cellophane and has a gold seal type sticker on the end. This seal is identical to the one that was used by De la Rue. Photo credits: all images courtesy Adam West-Watson.